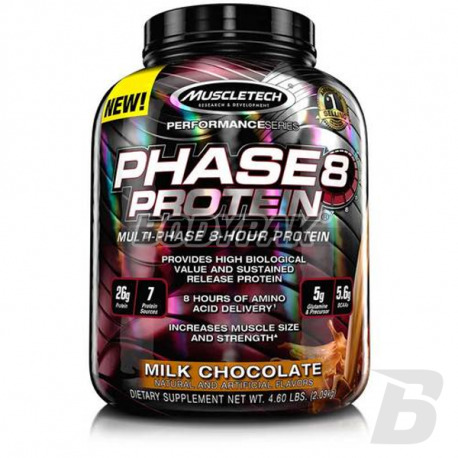 MUSCLETECH PHASE 8 is wolnodziałającym Matrix protein, which will feed your muscles for up to 8 hours. Each scoop has an impressive mixture of 26 g of the milk-derived proteins which provide sustained release of amino acids. 179 loyalty points Your cart will total 179 points that can be converted into a voucher of 7,16 PLN. PHASE 8 has a better, cleaner amino acid profile of only half the macronutrient carbohydrates and fats. Phase-8 is a unique matrix protein conditioner has six different types of proteins - hydrolyzed whey protein isolate, whey protein isolate, whey protein concentrate WPC, milk protein concentrate, kazeinina calcium and casein - ensuring the supply of amino acids into muscle for 8 hours. Phase-8 is excellent slow-release protein, which helps build muscle mass, and also accelerates the regeneration after training, providing anabolic environment in the body for a long time. 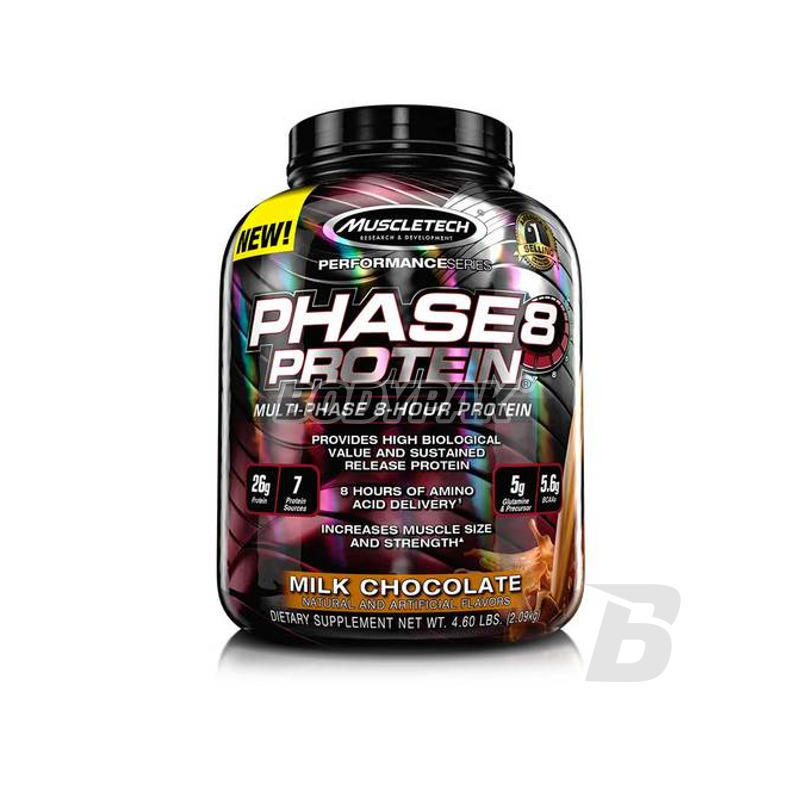 In addition, Phase-8 is a great flavor in the US is now one of the best selling protein supplements. Ingredients: mixture of proteins (milk protein isolate, whey protein concentrate, micellar casein, calcium caseinate, hydrolyzed whey protein isolate, whey protein isolate) (milk and soya), sweetener (maltodextrin), taurine, flavoring (cacao) glycine, natural and artificial flavors, thickening agent (cream based on sunflower oil [sunflower oil, corn syrup, sodium caseinate (milk), mono and diglycerides, dipotassium phosphate, tricalcium phosphate, lecithin (soy), tocopherols (as a preservative), sweetener (acesulfame K, sucralose), papain, amylase. Smak czekolada - z mlekiem zdecydowanie za słodki, z wodą ok.
Efekty zadowalające ale...bąki po tym przypominają wybuch bomby w Nagasaki - masakra, o zapachu nie wspomnę bo smród tych gazów przeżyłem tylko ja.